“Weeping walls" can be impregnated gently with slower curing mixtures of resin. 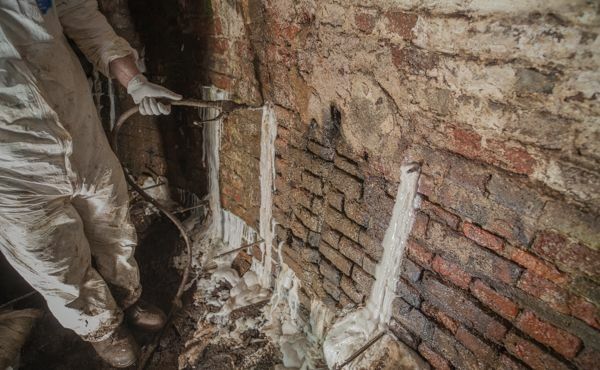 The water is effectively pushed out of the wall as the expanding resin “freezes” forming a waterproof structure inside brickwork and replacing water and lost grouting. As this barrier cures, the pressurised resin bleeds backwards to the near side of the wall where it leaks out of every nook and cranny as it forces the water from the wall. 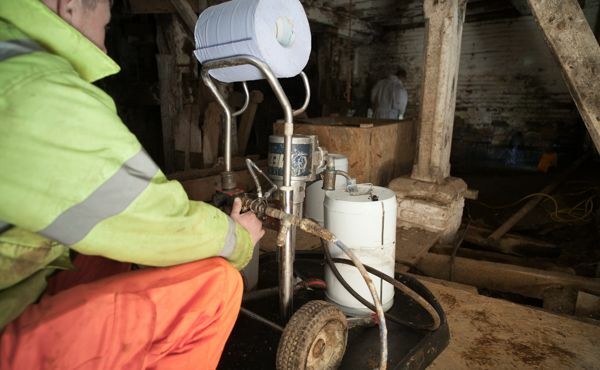 The curing resin is shown dribbling down the wall. These white rubbery streams are easily removed when the resin solidifies. After six months the wall is now dry and happy. The whole building is far more airy and theres a feeling of warmth in the place that’s never been there before. The team from Oxford Hydrotechnics injected a hydrophobic resin that is thinner than water into the structure of the wall. This is a common cure for serious leaks in tunnelling applications encountering subterranean water. The resin can be brewed to cure at different rates. When the resin meets water it reacts by rapidly expanding up to twenty-fold in volume. Big leaks can be quenched instantly by quick acting resin that forms a waterproof flexible foam that fills large voids and blocks large holes. The mill race flooded shortly after we bought the mill. 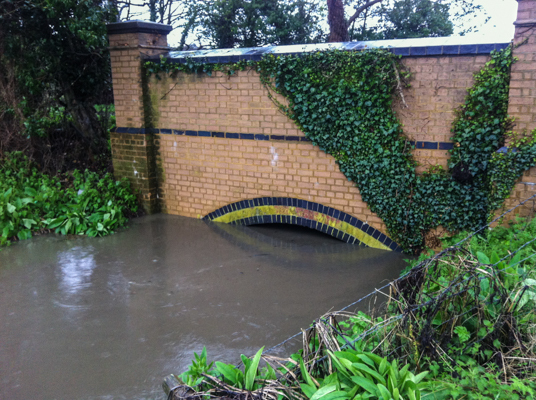 This picture shows the bridge by the footpath with the water almost up to the top of the arch. 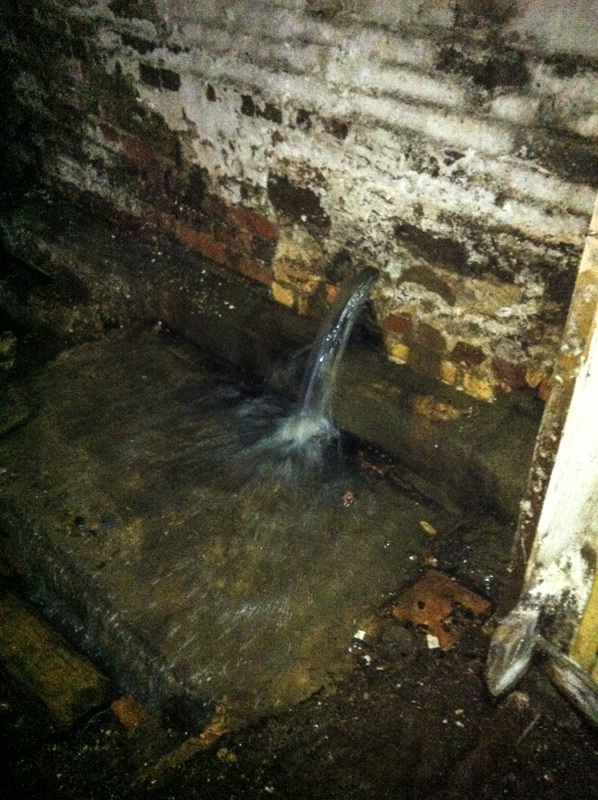 When we bought the mill, there was a serious leak in the west wall that had been there for a number of years. When the water levels were high in the lake at the back of Flitwick Mill House, a rod of water poured through into the mill. The floorboards of the ground floor had been rotting away in the humid environment for many years.